John Walter Douglas (Doug) Hargreaves (84) died peacefully at home, Kingston, Ontario on July 5, 2016 surrounded by family. One of the most recognized and respected figures in Canadian university football, Doug will be remembered for his professional contributions, as an inspirational role model and mentor, and as a devoted and loving husband, father and grandfather. He was a graduate of Queen's University (B.A. 1960) and Dalhousie University (M.Sc.1975) and served in the Royal Canadian Air Force for 14 years, retiring with the rank of Major. Doug had a long and successful career as a coach and educator at Royal Military College (RMC), Dalhousie University and Queen's University. In 2012, he received an Honorary Doctorate of Laws from Queen's in recognition of his contributions to the university, intercollegiate athletics, the sport of football nationally and in Europe, and for the positive impact he had on the lives of many hundreds of young people. Doug is survived by his beloved wife of 60 years Norma; daughters Vicki, Gayle (husband Peter Muir) and Lynn; cherished grandsons Jeremiah (partner Hannah) and Eli (partner Ginny) Bach, Alexander (wife Xiaowei) and Gordon Muir; brother Ward (wife Judy); and cousins, nieces, nephews and aunt. Although honored many times for his professional contributions and accomplishments, Doug's most enduring legacy consists of his inspirational approach to leadership and life. His children and grandchildren, and many of his players and students, follow those values and principles in their lives and careers and will carry them forward to a new generation. He was a source of optimism, encouragement and energy; a man of uncommon modesty; respectful and respected in turn. Born in Sault Ste. Marie, Ontario on December 20, 1931 to Violet (McCullough) Hargreaves and Charles Gordon Hargreaves, Doug remained a Soo boy at heart all his life. His parents were two of his most loyal fans, often traveling many hours to attend sporting events when their son was playing or coaching. Doug's beloved brother Ward was a confidant and best friend to Doug through the years. Doug came to Queen's in the early 1950's as an Officer Cadet in the University Reserve Training Program. At Queen's he played varsity football and basketball, and met his future wife Norma, who was a Queen's student before completing Kingston General Hospital's School of Nursing program. In the years following graduation, Doug taught high school, sold insurance, worked as a TV weatherman and coached various high school sports before reenlisting with the RCAF. He served in the RCAF until 1972 as a pilot, instructor, administrator and head coach of both football and basketball at the Royal Military College in Kingston, Ontario (1965-70). Having attained the rank of Major, Doug retired from the armed forces to take on the roles of Men's Coordinator of Athletics and head football coach at Dalhousie University in Halifax, Nova Scotia. Doug was thrilled to return to Queen's in 1976 as head football coach and to teach in the School of Physical Education. In his roles as coach and mentor, Doug had a profound impact on the lives of hundreds of young people, many of whom became lifelong friends. Doug led by example: with integrity, preparation, poise, perseverance and dignity. He emphasized the importance of character, hard work and academic rigour, and demonstrated how sport and competition enhance each of those elements. He stood for a standard of excellence that was second to none, yet his personal motto, "Be flexible and keep your sense of humour," reflected a keen understanding of the waywardness of life, the inevitability of human error, and of his own foibles. He encouraged others to persevere; taught that hard work overcomes much; and most importantly, to believe in themselves. Respected Canada-wide for his well-coached and disciplined teams, Doug led the Queen's Golden Gaels to 16 consecutive OQIFC playoff appearances and made 13 league championship appearances, winning nine of those title games and posting two undefeated seasons. While he was head coach, the Gaels appeared in three National Championship games, winning twice. Doug earned OQIFC Coach of the Year honours five times while at Queen's. 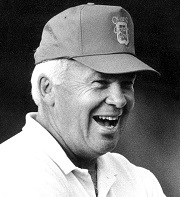 In 1983, he was awarded the Frank Tindall Award as the top intercollegiate head coach in Canada. Doug's Canadian Intercollegiate Athletic Union record of 128 wins, 103 losses, and 3 ties spans a career from RMC, Dalhousie, and Queen's. In 1994 he retired, having coached the most football games (233) in CIAU history up to that time. Since 1995, the Most Outstanding Offensive Player at Queen's has been awarded the Doug Hargreaves Trophy. Doug is a member of the Queen's Coaches' Hall of Fame, the Queen's Football Hall of Fame, and the Kingston & District Sports Hall of Fame. In 1997, he received the prestigious John Orr Award, the highest alumni tribute given by the Queen's University Board of Trustees. The Kingston Branch of the Queen's University Alumni Association honored Doug with the Jim Bennett Achievement Award in 2005. Doug served on the CIAU Rules Committee for 10 years, was a member of Football Canada's Working Committee (creating the Coaching Technical Certification program for Canada), and pioneered the exporting of the Canadian game to various European countries. He was instrumental in the forming of the Queen's Football Club and the catalyst behind the Queen's Football Hall of Fame. During retirement, Doug took great pleasure in the company of family and friends - both old and new. He and Norma spent many winters downhill skiing in British Columbia. Doug returned to the skies and made a new circle of friends when he began building and flying scale radio-controlled aircraft. An avid sailor, he never turned down a chance to get out on the water. In later years, he delighted in the life adventures of his grandchildren. As his health declined, Doug kept his sense of humor and quick wit. Laughter was commonplace when friends and family visited, and during his regular phone conversations with his brother Ward. A Celebration of Life will be held at the Senior Staff Mess, Royal Military College on Sunday, July 10, 2-5 pm. The family suggests that memorial contributions be sent to Hospice Kingston, Residence Program at canadahelps.org or to the charity of your choice. Our deepest condolences to you Norma and those three wonderful women that we "baby sat" over fifty years ago. We have so many fond memories of time spent with the Hargeaves and we cherish greatly how Doug's guidance and direction influenced my life. As a life long friend of Ward I have acquired a "Big Brother"! We regret that Judy's state of health and my older brother's placement in the local hospice will not allow us to get to Kingston to be with you. Doug's life should be celebrated and always fondly remembered! Love Dan and Judy Carmichael. Doug lives on in not only his family but in the hearts and minds of all the players he developed. Long may his spirit be with everyone who knew and loved Doug, guiding you on the field of life. Norma and family. Our sincerest condolences to you at this time. Coach Doug had a tremendous impact on my life. Peter Harrison and family. Norma and Family. My family and I send our sincerest condolences and are thinking of you at this time. Coach Doug had a tremendous impact on my life and I am forever grateful. Please feel free to leave a message of condolence, by completing this form. Please type the approval code from the graphic into the cell beside it to complete the form process. Please make sure you leave your name in the message.